I suppose I’m going to have to emulate my friend Joe Romm here and throw some mud at the NY Times. I moved to Malibu 5 years ago because I surf a lot. I’ve been involved with California ocean conservation issues for the past decade. So it was inevitable my interests would connect with the controversy over the “restoration” of the Malibu Lagoon (I use quotes because it’s not really the best term for it — nobody is really trying to figure out the pristine condition and return to it — a better term would be “revitalization”). 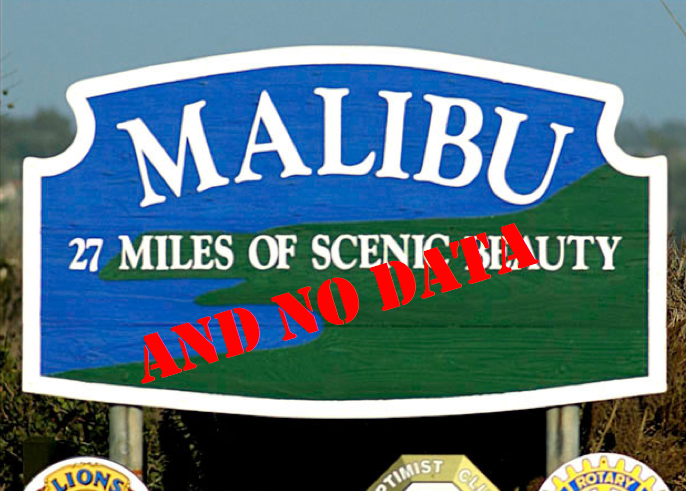 Today there appeared this article by Adam Nagourney in the NY Times about the issue, and here’s the problem: the Malibu Lagoon story is about SCIENCE VS. NON-SCIENCE. That’s EXACTLY what it came down to with the April 11 City Council meeting. I WAS THERE. It was how the meeting ended, with Mayor John Sibert and City Council Member Lou Laplante very politely saying to the opponents of the lagoon restoration plan basically, “We’re sorry, we’d really like to give your argument consideration, but you have no science or scientists behind what you’re saying, and until you do, we can’t.” You can view the video of their actual discussion HERE. Okay, simple question, Mr. Nagourney … why didn’t you open your article with that perspective? In your article you don’t mention the words “science” or “scientists” even once. What you do mention repeatedly is “environmentalists.” You know what that term says to me — “bleeding heart, hyper-emotional activists who may or may not have some data behind what they are saying.” That’s not the case with the Malibu Lagoon. There’s more than 10 years of decision-making and scientific research. How can you write an article on this issue and not lead with that? Yes, in the third to last paragraph you have buried the fact that there is, “Abundant scientific evidence,” but with that you’ve sort of shown your hand — lead with the shouting opponent, bury the facts at the end. That’s not what I had in mind when I talked about “arouse and fulfill” in my book. We live in a society where our legal system is built upon evidence-based decision making (as opposed to hearsay). And we try to make environmental decisions based on scientific evidence. The Malibu Lagoon story is a case of a great deal of science conducted by very reputable scientists being attacked by people with no science or scientists. Yet the only dialogue Mr. Nagourney reports from the April 11 City Council meeting is the crazed outburst by surfer Andy Lyons (that resulted in the one City Council member who was actually on his side having to call for the Sheriff) which was pure emotion and theatrics. Not that there’s anything wrong with that — he put on a good show, and everyone is glad to know there exists such passion for protecting important surf breaks. But it’s not science. T’AINT EASY. This excerpt from the excellent Surfline resource strikes at the heart of the matter. Local lore has it that a huge storm in 1969 created perfect surfing at Surfrider Beach for 15 years, but the same sort of storm in 1995 failed to restore it. What happened? Answer: waves occur in the OCEAN, a wild, untameable, and complicated place. And by the way, the surf element in the story is even worse. There is SO much science to the physical oceanography of coastal waves. It would have been nice if Mr. Nagourney had sought out a couple physical oceanographers to counter-balance the locals who feel so certain of how the dynamics of the three points at Surfrider Beach work. No physical oceanographer would EVER try to talk as confidently about wave formation as the local surfers have been doing. Even Surfline (the gospel website for most surfers which uses a lot of good science to make their largely-accurate predictions) put together an excellent resource on the controversy that presents the definite example of how complicated it all is as they mention the 1969 massive rainfall event that dumped 9.5 inches in 24 hours causing Surfrider Beach to be restructured and according to lore providing 15 years of great surf. But then they point out that almost the exact same sort of massive rainfall event in 1995 failed to create the same conditions. What was different? Let’s start with maybe the oscillating California current, longshore currents, internal waves, bottom topography, Coriolis effects, and a whole suite of other variables that make the study of physical oceanography a throbbing headache. I know. I studied dispersal of starfish and coral larvae. I’ve collaborated with physical oceanographers. I’ve read the literature. It’s not the simple, easily explained story the locals make it out to be. It makes me think of what I listened to a couple weeks ago about the Human Genome Project — a huge effort that started with simple ideas, but eventually led to a single conclusion, “Gee — turns out it’s more complicated than we thought.” That’s what happens when you’re actually doing science — you see how complex the real world can be.